In this educational guide from WWT we look at Pumps as Turbines (PaT) applications, in which pumps can be run in reverse in order to generate hydroelectricity. The energy consumption of pumps is an important consideration in the water industry, but what is less well understood is that centrifugal pumps can be used to generate electricity when the impeller is run in reverse – a so-called pumps as turbines (PaT) application. Using pumps in this way can be a useful form of small scale, low tech hydro-electric generation which can contribute to a good all-round energy-efficient operation. 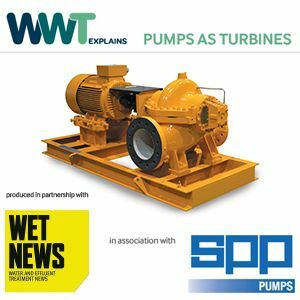 In this educational guide from WWT, sponsored by SPP Pumps, we explain how PaT applications work, how they are deployed in the water sector context and the benefits, considerations and challenges involved. In order to receive this download free of charge I am happy to share my contact details with the download sponsor, SPP Pumps Ltd . SPP Pumps Ltd would like to keep you up to date with their products and services. Please tell us the different ways they can contact you.